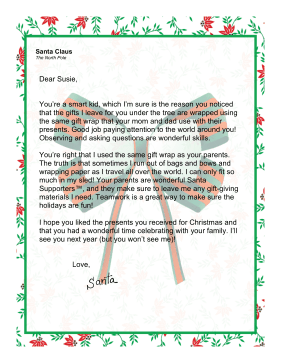 This Santa letter acknowledges that St. Nick sometimes uses the same wrapping paper as parents. You're a smart kid, which I'm sure is the reason you noticed that the gifts I leave for you under the tree are wrapped using the same gift wrap that your mom and dad use with their presents. Good job paying attention to the world around you! Observing and asking questions are wonderful skills. You're right that I used the same gift wrap as your parents. The truth is that sometimes I run out of bags and bows and wrapping paper as I travel all over the world. I can only fit so much in my sled! Your parents are wonderful Santa Supporters™, and they make sure to leave me any gift-giving materials I need. Teamwork is a great way to make sure the holidays are fun! I hope you liked the presents you received for Christmas and that you had a wonderful time celebrating with your family. I'll see you next year (but you won't see me)!